Former Black Panther Party Organizer Speaks in Vancouver! A Revolutionary Perspective from the Civil Rights Movement to the African Liberation Movement to Black Lives Matter! Malcolm X, Martin Luther King Jr., Thomas Sankara, Patrice Lumumba, Maurice Bishop, Black Panthers, are some of the most notable figures in the history of the struggle of the black liberation movement, social justice struggle, and fight for self-determination and dignity of black people around the world. They fought against the yoke of colonial oppression and capitalism and established themselves as an inspiration for the fight for a new and better world free of racism, discrimination and all injustices. 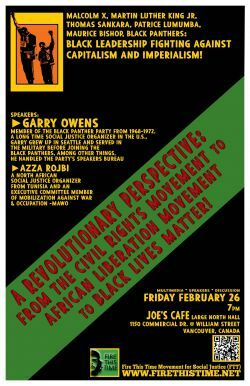 To commemorate the legacy and contribution of revolutionary black leadership, Fire This Time Movement for Social Justice invites you to a community forum featuring Garry Owens, member, organizer and a leader of the Black Panther Party from 1968-1972, as well as a long time social justice organizer in the United States. Come hear about the history of the Black Panther Party and revolutionary black struggle, and the need to revive this legacy today in the face of continuing racism, police brutality, mass incarceration, military aggression and imperialist war and occupation at home and abroad. >> Garry Owens, member of the Black Panther Party from 1968-1972 and a long time social justice organizer in the U.S. Garry grew up in Seattle and served in the military before joining the Black Panthers. Among other things, he handled the party’s speakers bureau.